When it comes to the 2019 Scholastic Art & Writing Awards, the good news just keeps coming for Klein ISD. On January 15, our fine arts department published Scholastic Art Awards, and we celebrated the news that 186 student artists earned regional Scholastic recognition, a 38% increase over 2018. Forty-one of these artists were awarded Gold Keys. 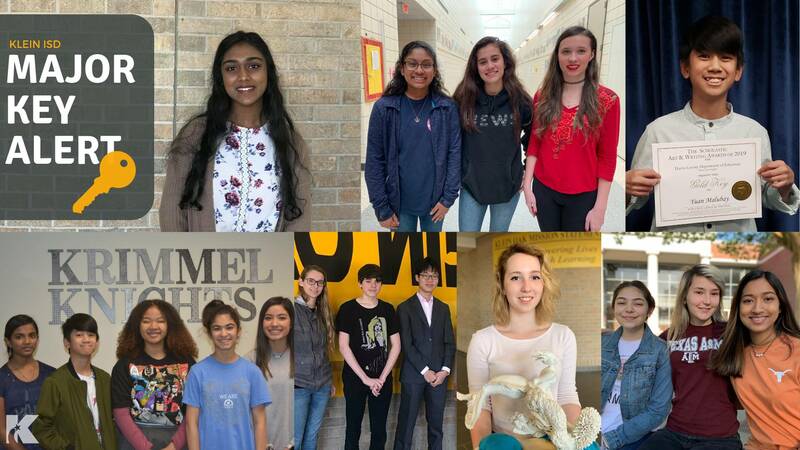 On February 4, in an article entitled “Scholastic Writing Awards: Klein ISD Scores a Record Number of Winners,” we shared news that 396 of Klein’s young writers were recognized at the regional level, a 64% increase over 2018. The writing recognition at the regional level included 104 Gold Key Awards. All regional Gold Key awardees in both art and writing advanced to the national level. During Klein ISD’s Spring Break, Scholastic announced the national medalists. At the national level, twenty of our student writers and three of our visual artists received medals (21 silver and 2 gold). To put this into perspective: In 2018, only two Klein writers received national medals: one gold and one silver. For more information on Scholastic Art & Writing , visit the Scholastic website at www.artandwriting.org.